It has been a week since the cancellation of our return flight to Haiti. We are in touch with Annette and the youth who live on the property of the Felician Mission in Haiti. They say that there are calmer days in Jacmel and that people are out on the streets. However, schools and institutions are still not open. We asked Fr. Samson, the pastor of our parish in Jacmel, to look out for those living at our mission and to lend us money for them, so they can purchase food and the special water coolant needed for the batteries that controls the inverter which produces electricity. Jean Philip noticed that the batteries needed a cleaning and more water. If the inverter fails, the mission will lose its power source, which means no refrigeration, no charging of phones and, after some time, no water because it depends on a pump. It could also mean loss of contact with our people. We also need to pay the staff of the Mother Angela Mobil Clinic. We are hoping Caritas International will be able to help. We ask for your continued prayers for our people. We have heard that the children keep coming to the mission hungry and asking where we are and when we will come back to continue their lessons, the faith formation program, and other activities. Our hearts ache for our children, and we want to be with them. Meanwhile, Sr. Marilyn will have gall bladder surgery on Thursday, February 28; and on Friday, March 1, Sr. Inga will have her kidney stones blasted. These will be done in two different hospitals in New Jersey. We offer our little suffering for peace in Haiti and a resolution that would mean a new civil order that gives life to all. Save us, Lord; we are perishing!” (Mk 8, 25): So begins a pastoral letter released on Feb. 11 by the bishops’ conference of Haiti. The letter calls for calm and dialogue amid a growing popular revolt that has rocked the Caribbean nation. Haiti has been on lockdown over 10 days of sometimes violent street protests in February. Immiserated by a 50 percent devaluation of the local currency over the past six months and incensed by alleged corruption within the government of President Jovenel Moïse, Haitians have taken to the streets. Protesters have been demanding, “Kot Kòb Petrocaribe a?” (“Where is the Petrocaribe money?”)—a reference to more than $4 billion in Venezuelan development funds that have vanished under the current administration. Barricades manned by unemployed youth have paralyzed transportation in the Western Hemisphere’s poorest country. Protestors have burned cars, looted private property and clashed with police, leaving at least seven dead. Demonstrations have brought all private and government business to a halt in the capital of Port-au-Prince and in the provinces. Days earlier in a communique to fellow Jesuits, Father Saint Félix wrote: “I have great difficulty seeing how this government can continue because it is being criticized on all sides for its incompetence and its inability to react well and on time. We are calling for the pure and simple departure of the President of the Republic, Jovenel Moïse, as well as that of Prime Minister Jean-Henry Céant. Popular dissatisfaction with government corruption was stoked this time by the swift decline of Haiti’s currency, the gourde, which has gone from 64 to the U.S. dollar to 86 to the dollar in less than a year. Inflationary pressure on prices for basic foodstuffs, fuel and even water set the stage for the countrywide demonstrations that erupted on Feb. 7, the anniversary of the fall of Haiti’s odious Duvalier dictatorship. The paroxysm that overtook the country interfered with the work of church relief efforts and international humanitarian organizations. “With so much chaos unfolding, it’s simply not safe for us to operate,” said Chris Bessey, the country representative for Catholic Relief Services in Haiti, in a statement released on Feb. 15. “As things deteriorate, there is a fear that all of the progress that’s been made in the last decade could be lost,” he said, “and that the entrenched poverty will become even more pronounced. When God asks Cain where is Abel, Cain says, “Am I my brother’s keeper?” Other translations say, “Am I responsible for my brother?” or, “Am I supposed to care for him?” The answer to that question resounds throughout the scriptures: “Yes! Yes! Yes!” We have a God-given responsibility to care for the welfare of others—-especially others in need. These words keep shouting in our souls as we think of our Haitian brothers and sisters and all that they are experiencing now. Since February 7, there has been civil unrest, demonstrations, road blocks, burning of tires, shootings, looting, deaths. The Haitian people just want their voices heard by their government leaders, especially wanting transparency regarding all the monies they had received to help their country physically, spiritually, socially. Businesses, schools, banks have all been closed; and everything is literally locked down. We think about and pray for our kids and teens, and all those with whom we are blessed to share life, to work with, to serve and to empower. We were to return to Haiti on February 17, but we were advised by many of our people in Jacmel not to return until things calm down. We would need to land in Port au Prince and then have a 3-hour drive through the mountains to Jacmel. Then the American embassy gave us the news–a level 4 travel advisory, no travel to Haiti at this time of unrest. Our hearts are aching as we think of those who have no access to food and water; those who cannot go to school because their teachers have not been paid; those markets which closed due to fear. God knows our prayers and listens, and so we pray today that hardened hearts will be opened to hear the cries of the poor so we can be the heart, hands, feet and bodies of Christ for others so we can again care for the welfare of our Haitian brothers and sisters. We stand with our people who desire to learn and grown and prosper. Please pray with us for a peaceful resolution to this conflict and for life to once again grow in Haiti. Haitian President Jovenel Moise has broken his silence after eight days of violent protests during which protesters demanded his resignation. “I hear you,” Moise said in an evening address to the nation, televised on the national television station, TNH, and streamed live on Facebook. “I will never betray you. You are the reason I ran for president. I’m working for you,” he vowed, reminding the country’s most underprivileged citizens that like them, he, too, came from humble beginnings. Moise has been widely criticized by politicians and citizens alike for failing to publicly respond to the demands of the people. He has also been vilified for his government’s lack of transparency and its ineffectiveness. Protesters nationwide have criticized soaring prices, sky-high inflation and corruption, which have led to worsening living conditions for many. Moise sought to diminish tensions by saying he understands the frustrations that led to the mass protests. Progress takes time, especially for the poorest nation in the Western Hemisphere, he said. Demonstrators flee as Haitian police open fire during clashes in the center of the Haitian capital of Port-au-Prince, Feb. 13, 2019. The president announced that he has taken a series of measures to make life better for Haitians and has asked Prime Minister Jean Henry Ceant to communicate those measures and apply them immediately. After his speech he tweeted that the prime minister would announce new economic measures on Friday. Moise warned those who seek to “force the country in a direction that is not in our interest” that they will not succeed. He said only a multiparty dialogue can solve the current crisis. Senate Leader Carl Cantave Murat echoed that opinion earlier Thursday during a midday press conference. According to VOA Creole’s reporter in Port-au-Prince, gunfire rang out in various neighborhoods as soon as the president’s speech ended. VOA Creole reporters say protesters were back in the streets Thursday night, seemingly undeterred by the president’s address. The national police, PNH, are using tear gas, according to reports. Meanwhile, in Washington the State Department has raised its travel alert for Haiti to level 4, the most serious. “Do not travel, due to crime and unrest,” the advisory reads. Matiado Vilme and Florence Lisene in Port-au-Prince, and State Department correspondent Nike Ching contributed to this report. 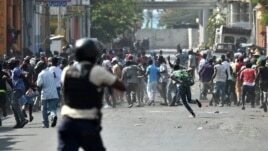 PORT-AU-PRINCE, Haiti – Sporadic gunfire echoed through the streets of Port-au-Prince on Monday as the government remained silent in the face of protests that have paralyzed the Haitian capital and triggered rising violence.